Mail order, Bank transfer payments. 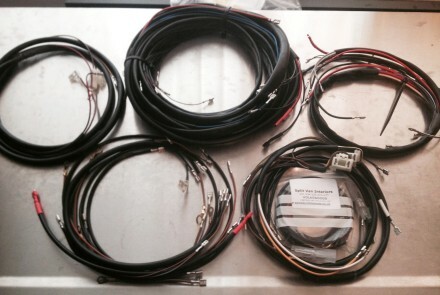 The Volksgoods VW wiring looms are usually built to order and manufactured as an exact replacement to your original, while offering the opportunity to make minor additions or adjustments. The loom (cables, PVC tubing & connectors) are provided for front and rear indicators, front and rear lighting, fuse connections and all in line connectors just like the original supplied by VW. Unlike some of our competitors, we aim to supply the complete wiring system, not just the main sections. However, if your need is for a main section only or indeed any other part of the loom, please check with us for prices. Because your electrical system is unique to your VW we keep details on file, should you need any modifications, changes or additions in the future. Camper van owners should be aware that extra interior lighting, especially when added by the 'converter' is not automatically included, but can be supplied on request or by arrangement. Similarly, battery cables are not included, but can be supplied as extra items. A number of VW loom patterns are held by Volksgoods, for Split Vans available by model year, (most August to July = 19XX RHD UK, LHD Euro and LHD USA) with vehicles up to 1967 well covered, others to follow later. Unfortunately if a pattern is not on file, then the only option may be to send your old loom to us. Regardless of what state it is in, we can usually work from it, provided it is more or less complete. All cables are to correct colour, with the trace (second) colour longitudinal as opposed to radial as on the very early VW's. One tri-colour cable (Black/Green/White) used by VW in the indicator circuit, has been faithfully reproduced. In many cases, we can offer either ‘thin-wall' cables, designed for modern looms, which have a smaller diameter due to a hard but thin insulation or the standard cables which are more flexible but correct to original designs. Blade connectors are supplied on the ends of most VW cables, with a choice of tin-plated for superior corrosion resistance, or brass exactly as per original, but please note there is a £10 surcharge for the brass terminations. Push-on nylon insulators for the blade connectors are provided but not fitted, indeed should only be fitted after installation of the loom. Original VW wiring looms did not have these, but fitting is recommended for safety reasons, especially in the unseen areas! All other modification requirements please discuss with us. While most of our looms are made to meet customer own specifications, the more popular looms are available 'off-the-shelf' for immediate despatch. Delivery is usually between 3 to 6 weeks from placement of order. Payment is due just prior to despatch. Prices quoted for wiring looms below are for 100% original specification with no modifications or additions.